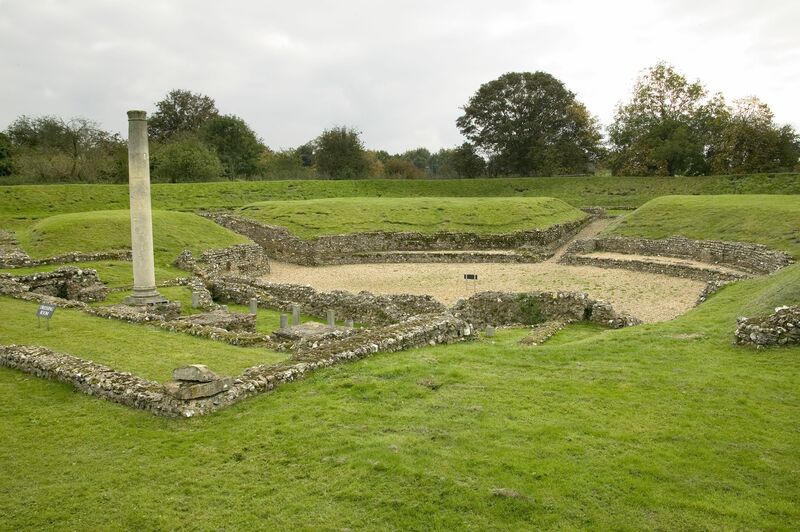 Verulamium was the first Roman town in Britain built around AD50. Attacked and razed to the ground by Boudica and rebels from the Iceni and Trinovantes tribes in AD 60/61. Partially destroyed by fire in AD 155. Where St. Alban, the first Christian martyr in Britain, was beheaded in the late third century AD. Excellent collection of mosaics dating from AD 150-300, including the Shell Mosaic, the Oceanus Mosaic and the Lion and Stag Mosaic. Enameled brooches of hares, horses and ducks. Lead coffins and burial artefacts. Wall sections 12 feet high. Outline of the London Gate. Large geometric/floral mosaic floors of a wealthy town house in situ. Only remains of a Roman theatre in Britain. Unusual because it has a round orchestra and resembles a small amphitheatre.